C-Trak has just finished a system installed into a large recycling plant. It pays to be green these days why not take a look at our video footage showing waste being conveyed at the plant and emptied into large containers. C-Trak will be closing down for the Easter break from 4.30pm Thursday the 5th April until 9am on the 10th April. All calls will be diverted and picked up by one of our sales engineers so no need to worry. Any emergencies applications can be dealt with. C-Trak is always here to help support our customer in any way we can. We would like to wish all of our customers a very Happy Easter and hope you all recharge your batteries in the long bank holiday weekend. Just to let all the followers of our new blog know we have now changed the blog so it is easy to follow. We want to keep our customers upto date with the latest technology on the market for their material handling using our bespoke conveyors. Our blog has been running since 2009 and we would like to welcome you to the new look. Please contact us if you would like to add your new conveyor products to our news blog. Our client often specify what type of conveyor belting they want on their conveyors. One that comes up time and time again is Intralox Belting as they are well known for the quality of their belts. If your looking for a competent conveyor company to supply you with a fruit, salad or vegetable conveying systems then contact C-Trak Ltd on 01525 850316. Expert advice and problem solving for your food handling process. New design for cleaning belts and removal has just been launched for total cleanliness of your conveyors. Our Fruit Conveyors will handle your products with care making sure no bruising occurs. This was a project that C-Trak took on for a reversible conveyor application for more information just follow C-Trak this will show you more photo’s and video’s. Having problems finding a conveyor company that can provide you with a belt conveyor that can withstand high temperatures. Well you need look no further. C-Trak have new heat resistant belting that can withstand temperatures up-to 300 degrees, we have just finished a particular job that needed to transport liquid plastic to go through a spray booth. We provided a cost effective solution for this company which has saved them time which of course mean money savings on their production line. C-Trak has just had an enquiry for extensive work for a modular magnetic conveyor system. Which includes 2 plastic modular belts plus extension of magnetic modular belt conveyor with rework. 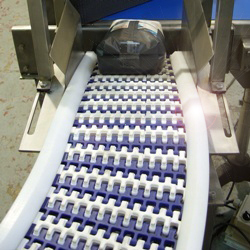 This is a typical type of conveyor application that C-Trak undertakes. Have you got a Conveyor Problem? Let us help you with your material handling we have very experience sales engineers that can come out to your premises and and help with a solution for your products. We have been manufacturing Conveyor Systems for over 30 years and your problems are our business. What is a modular belt conveyor. Well it is a bit like lego made up of plastic parts clicking together to form a woven belt of plastic links. C-Trak Conveyors can provide you with the ultimate Conveyor System that will last for years.